27cm wide x 30cm high. Media:- Letterpress block on cloth paper with Letraline applied by hand. At the end of the 1970’s Stephen Willats was working in the Märkisches Viertel in Berlin when he noticed the drawings made by children on the walls of the tower block in which they lived. The drawings were territorial, in that the children of each housing block made the drawings at the base of their own block, depicting a life which seemed to be in stark contrast to the modernist reality of their surroundings. The Berlin Wall ran past the end of these housing blocks and Willats noticed that one of the children had drawn a small house on one of the walls. 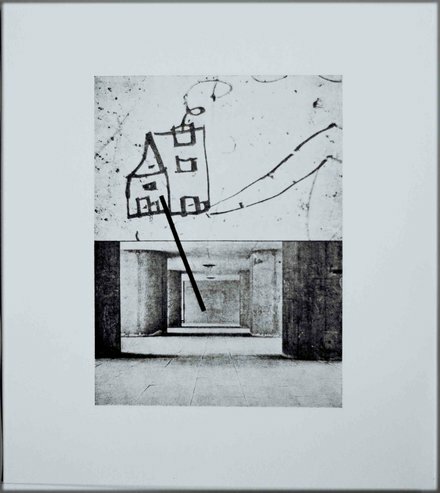 It struck him that the drawing represented an archetypal family house with smoke coming out of the chimney as opposed to the reality of their tower block apartment, and he subsequently photographed the position of the drawing as seen through the concrete columns beneath the housing block where he was working and then he took another photograph closer up. In Wall Print, the black line made by Stephen Willats connects the children's dream with the actual reality.